Captain Sylvia Trundle was seeking ways for the police department to partner with OPEN M after having worked as a patrol officer in the Summit Lake neighborhood. She began using OPEN M as a resource in her job, but that became just the beginning of her involvement and support. She began supporting OPEN M with her time and resources, and she invited two very special ladies in her life to join her – her mother, Kay Hine, and her grandmother, Sylvia Phillips. Sylvia, Kay, and Sylvia have been enthusiastic participants together in the spring OPEN M Walk for many years. Sylvia Phillips made the trek until she was 98 years old. At 103, while no longer a walker, she remains vibrant and active – a “social butterfly” who continues to support her daughter and granddaughter in their endeavors. 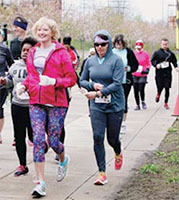 Sylvia Trundle and her mother continued the tradition this year, and Sylvia upped the distance as a runner in our inaugural 5K. With her daughter’s encouragement, Kay began serving hot lunch at OPEN M with Sylvia Trundle’s church – Peninsula United Methodist. She loved it and began to get her own church – Copley United Methodist – more involved at OPEN M. Kay now serves as a church rep; she organizes the collection of hats, gloves, and scarves for Christmas, as well as food items; and she collects the plastic bags utilized every day for food distribution in the pantry. “I’m so proud of my mom! I’ve loved watching her blossom,” says Sylvia. Her passion to serve at OPEN M has given Kay the confidence to get up in front of a group of people and organize donations – something she never felt like she could do before. Sylvia loves OPEN M’s open door approach to the community and the way that they help people no matter where they are in life. “OPEN M collaborates well. It reaches out and embraces other organizations and people. That’s how it is supposed to be,” she says. Sylvia felt honored when Dottie Achmoody asked her to join the OPEN M Board in 2014. Captain Trundle, the honor is all ours! OPEN M has been blessed by the gracious service of three generations of caring and committed women. This entry was posted in Charity, Community, Health, Neighborhoods, Poverty and tagged Akron, Akron News, Akron Police Dept., Community, Community Works Connection, Economic Sustainability, Education, Family Development, Food Pantry, Free Health Clinic, Health, Neighborhoods, nonprofits, OPEN M. Bookmark the permalink.